From picking your itinerary to mapping out all of the small details, planning a Holland America Line cruise is always an exciting endeavor! Once you’ve tackled the decision of where to go, you can move on to arranging all the fun activities you want to take part in both onboard and on land, including Journeys Ashore. With a variety of shore excursions to choose from, it can sometimes be overwhelming to narrow down what you want to do. However, if your cruise sails to a tropical destination, there’s one kind of excursion you can never go wrong with: a sailing tour! If you’re truly looking to soak up the sun and beauty of the paradise you’re visiting, there’s no better way than getting out on the water and taking in all of the amazing sites the port of call offers. Read on for some of our top sailing excursions! Once you board a 65-foot catamaran, you’ll sail to Chileno Bay, cruising by Cabo’s famed Lover’s Beach, past the sea lion colony, the arch and the towering rock formations of Land’s End. Snorkel among the tropical fish in the azure waters of the Sea of Cortes in a bay featuring a large reef, which is home to parrotfish, angelfish, Moorish idols and manta rays. Adventurous types can swim to the beach and, for first-timers, snorkel lessons are available upon request. On the return voyage, an assortment of finger food snacks and open-bar drinks will be served. Unwind as the sails are hoisted and enjoy the beauty of Los Cabos! Relax on the deck of a fabulous catamaran as sunlight sparkles on the surface of the azure waters of the Caribbean Sea. Smiling faces offer cool, refreshing drinks as you glide past the beautiful palm-fringed beaches of Barbados. This mini-cruise leaves the Bridgetown Shallow Draught and, after a pleasant sail along the coast, anchors in a quiet bay where you can take a dip in the ocean, snorkel over a reef, walk on the beach or just relax on the deck. A delicious buffet lunch is served with wine. Enjoy around 90 minutes of relaxation before sailing to a different area to snorkel and swim with turtles. 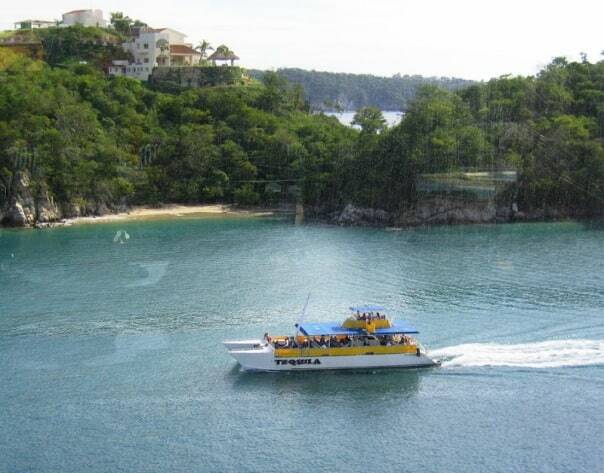 Huatulco is known for its beautiful bays and beaches. 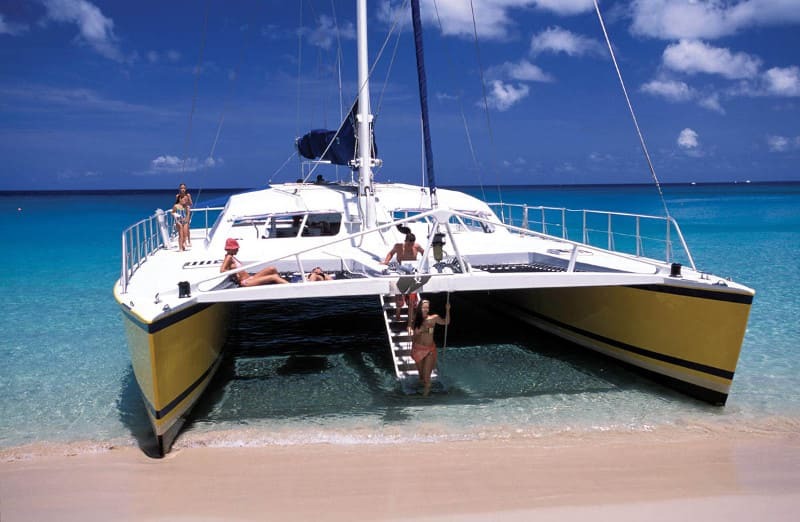 Visit five out of its nine bays aboard the motorized catamaran, Tequila. Pass the spectacular blowhole in the next bay and look up to the ‘stone face’ rock formation as you sail into pristine Organo Bay for a 30-minute swimming stop. Visit peaceful Maguey Bay and later cruise by Conejos Bay then Tangolunda Bay with its natural beauty, hotels and residential areas, before returning to the pier. Set out on a voyage reminiscent of a time when the seas were plied by sailing ships that were not only transportation, but genuine works of art. 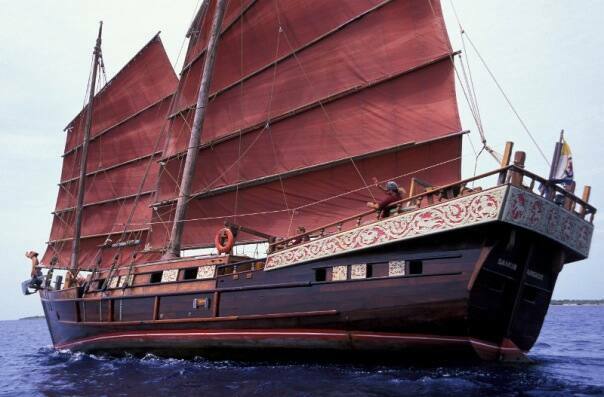 The Samur is an authentic Siamese junk — a hand-built and hand-carved relic of those days. Set sail and glide smoothly under the distinctive red sail across the strait to uninhabited island of Klein Bonaire. During the journey, the captain gives information about the reef and its fishy inhabitants and shares with you the history of this Siamese sailing junk. Drinks are served as the crew hands out snorkel gear (fins, masks, snorkels and inflatable snorkel vests). After about 45 minutes, you’ll arrive at Klein Bonaire. Jump into the Zodiac for a ride to the pristine white sandy beach. Snorkel from there or take the Zodiac to the outer edge of Ebo’s Reef. Those comfortable with drift snorkeling will find themselves, courtesy of the gentle current, back at the beach in about 20 minutes. Enjoy about an hour at the beach before re-boarding the junk where you’ll relax with a rum punch, fruit juice, soft drinks and platters of tropical fruits en route back to Kralendijk. View Aruba’s beautiful beaches and resort hotels while relaxing on the open decks of a sailing catamaran specially designed and built for day cruises. 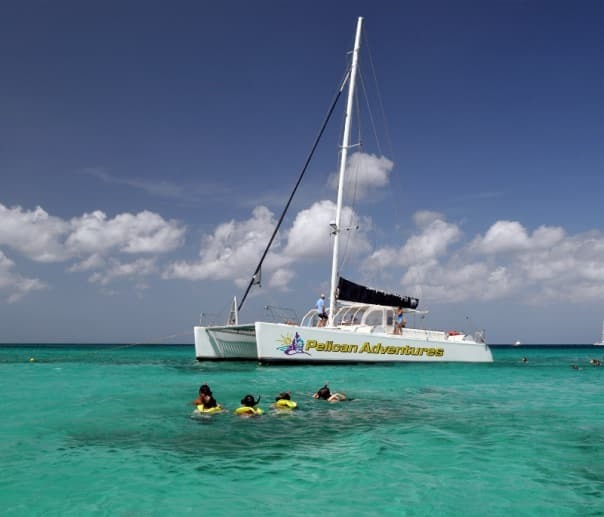 The catamaran anchors at the west point of the island, and ladders provide easy access to the water for an hour of swimming and snorkeling in the crystalline water teeming with tropical fish. Continue to Pelican Marina and experience Aruba’s famous Palm Beach. Here on the white sandy beach, the crew will serve unlimited drinks. Relax on a lounge chair or take a walk along the beach. More adventurous guests may want to try one of the many watersports activities (at your own expense) or try your luck in one of the many casinos within walking distance. There is a café, seafood restaurant and bar located at the water’s edge. Sail back to the cruise terminal enjoying tropical cocktails and entertaining Caribbean music performed by the professional crew. Guests who wish to stay at the beach independently are welcome to do so, but must return to the ship on their own. 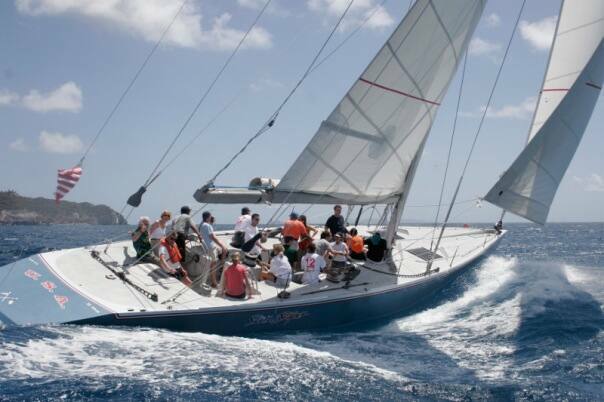 One of the best shore excursions in the Caribbean, the St. Maarten America’s Cup 12-Metre Regatta offers you the only opportunity in the Caribbean to race an exotic multimillion-dollar America’s Cup racing boat. Experience the exhilaration of America’s Cup yacht racing aboard Dennis Conner’s cup-winning Stars & Stripes or contenders Canada II or True North. You compete in an actual race around a shortened America’s Cup course, and you’re invited to ‘work the boat’. The experienced crew provides all the guidance you need to grind a winch, trim a sail, punch a stopwatch, or take the helm and ‘drive’ the race boat. Or you can just sit back, relax and enjoy what is perhaps the most exclusive sporting event in the world. No previous sailing experience is required. All you need is a spirit of adventure and be ready to have the time of your life. Refreshments are provided, and a rum punch party rounds off this spectacular event as you browse in the 12-Metre Regatta boutique. Are you a sailing aficionado or are you ready to take your first adventure? Tell us in the comments below! I highly recommend the 12 Meter sailing adventure. My husband and I both loved it. It is one of the best things you can do. We were fortunate to be on the Stars and Stripes racing against True North. Our team won the race!